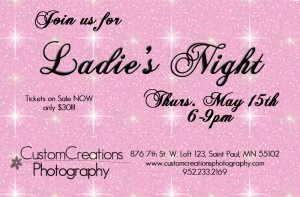 Please join us for Ladies Night on Thurs. May 15th from 6-9pm at the studio in Saint Paul, located in the Historic Schmidt Artist Lofts. Hear all about the upcoming Spring Trends in makeup, skincare, meal making, entertaining, and so much more!!! It will be a great evening, grab a girlfriend and purchase your tickets today! Space is limited to the FIRST 25 LADIES that purchase their tickets! Tickets are only $30 and include: wine, yummy snacks, chocolate, premium education, and an amazing SWAG BAG filled with goodies!!! These are all some of my very nearest and dearest friends and vendors, I promise you that you will have a blast and learn a ton. This is NOT a sales attempt, you are under no pressure to purchase anything!! This is an educational, fun, relaxed evening ~ and will walk away with a fantastic SWAG BAG and some really great ideas for spring/summer!! Purchase your tickets NOW via Paypal. Space is limited to the FIRST 25 LADIES that purchase their tickets! You will receive an email with directions the week of the event. Your paypal receipt is your ticket to the event! !